30mm 18K white gold case set with 254 brilliant-cut diamonds, 7.45mm thick, sapphire back, beaded crown set with a brilliant-cut diamond (0.12 carats), sword-shaped hands in blued steel, 18K white gold bezel set with 43 diamonds, sapphire crystal, silver dial, caliber 9616 MC manual-winding movement, approximately 3 days of power reserve, fuchsia alligator skin strap, folding buckle. Water resistant to 3 bar. Extra large size, 18K pink gold case, chocolate dial, manual winding movement with power reserve and date, brown leather strap with 18K pink gold ardillon buckle. Water resistant to 30 meters. Extra large size, 18K pink gold case, silver dial, manual winding movement with power reserve and date, brown leather strap with deployant buckle. Water resistant to 30 meters. 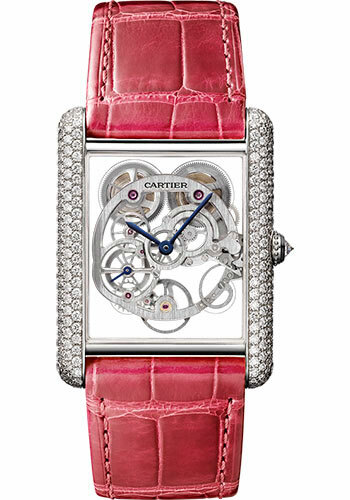 30mm x 39.2mm 18K white gold case, 7.45mm thick, sapphire back, beaded 18K pink gold crown set with a blue sapphire cabochon, 18K pink gold case bezel, sapphire crystal, skeleton dial, caliber 9616 MC manual-winding movement with blued-steel sword-shaped hands, approximately 3 days of power reserve, black alligator skin strap, double adjustable folding buckle. Water resistant to 3 bar. 30mm x 39.2mm 18K pink gold case case, 7.45mm thick, sapphire back, beaded 18K pink gold crown set with a blue sapphire cabochon, 18K pink gold case bezel, sapphire crystal, black dial, caliber 9622 manual-winding movement with blued-steel sword-shaped hands, approximately 3 days of power reserve, brown alligator skin strap, double adjustable folding buckle. Water resistant to 3 bar.